Comments: From the Kassel gig on 'Hot Space' European tour 82. Morgan Fisher (ex Mott The Hoople) plays on keyboard. Fred Mandel is wrongly listed as keyboard player. Mandel did keyboard on the USA & Japanese 82 tour. Looks like a complete concert. As far as I know, this is the only pro-bootleg release from this concert. Roots: From an audience recorded tape. “HOT SPACE TOUR 1982” which was skipping well. It is the appearance of a masterpiece live album that conveys the scene. What is sealed in this work is “Kassel Performance May 18, 1982”. 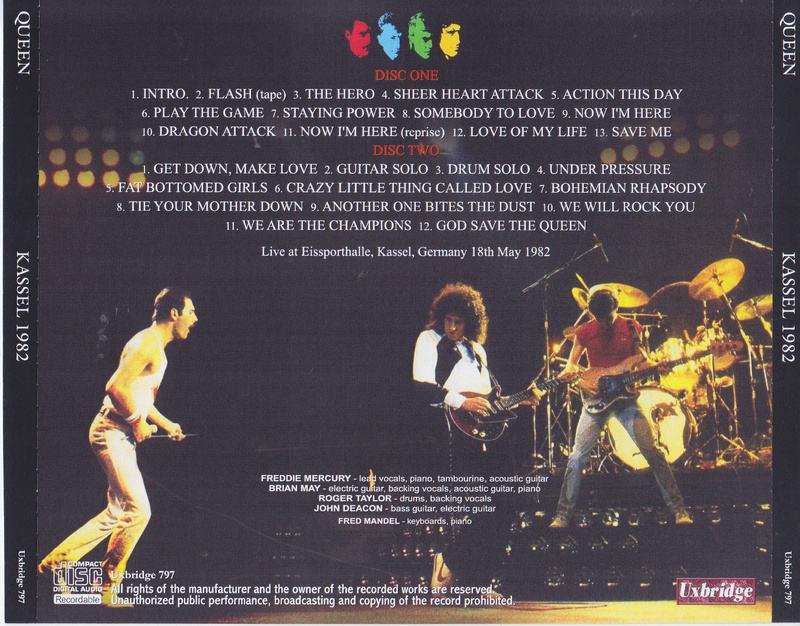 It is a part of the European tour which took place before “HOT SPACE” was released. This European version is also known for the fact that a number of nominations have been recurred, but West Germany is particularly terrible. In this week’s simultaneous release “HAMBURG 1982 (Uxbridge 801)” commentary, we introduced the whole world tour so let’s zoom in to the European schedule in more detail. This is the early stage of “HOT SPACE TOUR”. Although it is circulating around each country finely, the main is obviously West Germany. All twelve performances over three times were three times as much as the home country UK. QUEEN was popular too much, but that enthusiasm also invoked the audience. In our shop we have reported with masterpiece such as “FRANKFURT 1982 (Wardour – 188)” and “West Germany # 2” “WURZBURG 1982 (Uxbridge 781)” of “West German # 1”, but this week it is “West Germany # 3” . “HAMBURG 1982” at the same time was the 2nd performance of “West Germany # 3”, and the Kassel performance of this work was a concert that was the 3rd performance. Such a work is a spectacular audience recording representing the latter part of the European tour. “HAMBURG 1982” was a vintage style like a little mania, but this work sounds soaked comfortably by everyone. There is no mistaking type as a sound board, but a strong core reaches strongly, thick sounds do not hide details. Although the presence of this show ‘s recording was known for a long time, this work is its highest peak. It digitized directly from the rouge cassette which was discovered by overseas QUEEN researcher, it is much brighter than before. Each buddha’s vigor cleverly, the base line stands out clearly. Of course Brian’s guitar is also brilliant, and Freddy’s singing voice knows lyrics as well. And the important thing is the big performance performed with that sound. It is Europe in 1982 where a good show was spreading everyday, but this day the tension is high in addition to the best condition. Although the performance is also crispy, Freddie is also prominent. Because I was on holiday the previous day, my voice grew neat and tight and I was fine. The tension is also high, “Yeah eahhhhh !! This is Staying Power!” “Say Cool Cool Cool Cool Baby !! !” is blown off. “Somebody to Love” Intro also singing with deep vivalat, growing powerfully everywhere. It is also a sound that makes sense for such a great sensation with a sense of resistance. And more interesting is “Sheer Heart Attack”. Normally it will be a highlight in the final stage of the show, but this day suddenly appeared in the second song following “The Hero”! Although it is a compact version that cuts three minutes, I was surprised to see it jumped out when I thought “I’m feeling well” from the performance. Perhaps it is a surprise inserted because the West German schedule is massive, but the venue is surprised and the tension rises at once. And it is terrible since the tension will not fall afterwards. It is a masterpiece that the best performances are pulling up to Guyugui and the concert as it is. 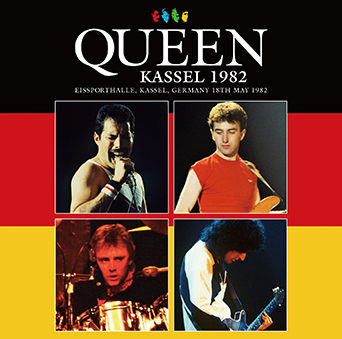 It is a must-read live album that jumps to the surprise of “Sheer Heart Attack” in West Germany in 1982 caught in masterpiece recording. A commodity that can be immersed in the best show riding in the low genre sound that the researcher found out. By all means, please enjoy it to your heart’s content.